Information about Goat Lick Overlook is provided by Glacier National Park. Located along U.S. Highway 2, approximately two miles southeast of the Walton Ranger Station, is an exposed riverbank where mountain goats and other animals come to lick the mineral-laden cliffs. From the parking area, a short paved path leads to an observation stand overlooking the waters of the Middle Fork of the Flathead River. 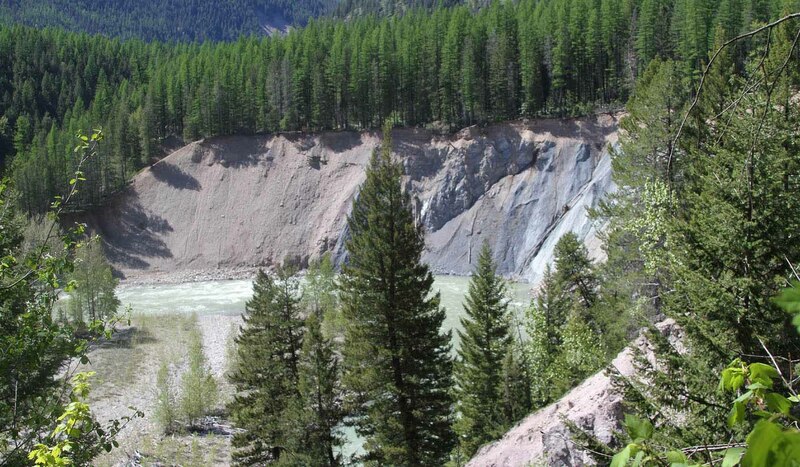 The river's current has cut deeply into the easily eroded soil in this area, creating steep drop-offs and exposing a mass of gray clay containing minerals sought after by mountain goats and other animals. There are several other natural mineral licks in the park, but probably none that receive as much use by goats as this one. The Goat Lick is an exposure of the Roosevelt Fault and is comprised of gypsum, kieserite, and sulfates. The shift to succulent green vegetation each spring alters the goats' mineral balance and may cause them to seek the minerals found at the Goat Lick. Calcium, potassium, and magnesium plus lesser quantities of sodium and phosphorus found in the lick may help replace the elements goats typically lose from their bones during the winter. Additional explanations for visits to the lick include: an acquired taste for salts; a need for the minerals as a digestive aid; and the high goat concentrations, which may allow for more intensive social interactions. Glacier National Park goats travel as far as four miles to get to the Goat Lick, while others from more widely dispersed areas in the Flathead National Forest travel several times that distance. April through August are the most concentrated use periods, although use may occur year-round. During late June and July, dozens at a time may gather here. Mountain goats from Glacier National Park. The animals focus their activity at wet seeps on the lick where more minerals are carried in solution. Mountain goats are crepuscular in nature, and daily use of the lick tends to occur most frequently during twilight spans of dawn and dusk. A goat typically licks for a total of 24 hours, in 4-6 hour durations, on its first seasonal visit to the site. After the first day, more time is spent in feeding and bedding. Because individual goats compete for the best licking area, aggressive interactions are common on the lick. Watch for threatening horn swipes and rushes. The social ranking of goats serves to reduce direct conflict which, due to the sharpness of their horns, could result in serious injuries. At the lick, adult males (billies) and females (nannies) with kids share a position of near equal dominance, followed by barren nannies, subadults, and yearlings. On the range, however, adult billies often appear to be subordinate to nannies with kids. Located along US Highway 2, approximately two miles southeast of the Walton Ranger Station, pass Essex and before the Marias Pass on the southern end of Glacier National Park.